BOGNOR REGIS, UNITED KINGDOM – Lloyd Instruments has introduced five new, cost-effective machines to its line of universal test machines for materials testing up to 100 kN. 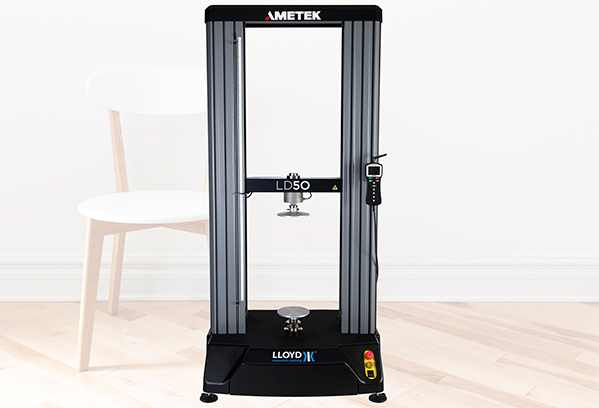 The LD5 universal test machine is ideal for materials testing up to 5 kN; the LD10 version is suited for testing up to 10 kN; the LD30 is for materials testing up to 30 kN; and the LD50 and LD100 has it covered for material tests all the way up to 50 and 100 kN. All the new machines feature a large working area that is 452 mm wide and a crosshead travel of 1070 mm that is extendable to 1669 mm. This provides the machines with the flexibility for complex testing of small- or medium-sized samples, as well as for heavy-duty testing on large samples. With their rugged design, LD Series test machines are built for long life and reliable operation. In addition, the LD Series offers an advanced electrical design with a modern AC drive and preloaded ball screws to ensure better speed and displacement accuracy. A high stiffness frame helps prevent frame deflection and crosshead movement, while the use of pancake load cells improves accuracy at the cross axis and increases work area. The new LD test machines are designed for ease of use. They help automate testing, reduce costs and save time. A CANBUS interface provides fast, accurate communication between the LD Series test machine and such add-on accessories as extensometers and temperature chambers. LD Series test machines are supplied with the NEXYGENPlus analysis software, which makes advanced analysis and reporting quick and simple to perform. An extensive library of pre- programmed test setups ensures error-free testing, while built-in test wizards guide users through advanced customized test setups. Test results can be automatically exported directly into Microsoft® Word or Excel using user-defined corporate templates or pre-defined NEXYGENPlus templates for analysis and reporting. Video and still capture provide additional analysis features that allow users to examine a product after a test has been carried out. Large graphs display test results in an easy-to-read setup, and users are able to follow the test results live on the screen. Clear colour marking separates good and bad test results for easy Go / No go decisions. In addition, a simple change of grips enables the modular LD Series test machines to meet any testing needs regardless of industry, material or test type. An extensive range of easily interchangeable load cells, grips, extensometers, temperature chambers and other accessories are available. Custom grips also can be precision made on request for specific applications. Featured on the popular television series How Its Made, AMETEK STC is among the world’s leading manufacturers of materials testing equipment, which are manufactured to the highest quality standards at its plant in Largo, FL, USA. AMETEK STC is a unit of AMETEK, Inc. a leading global manufacturer of electronic instruments and electromechanical devices.